On the surface, there’s not too much to say about the Northwestern basketball game against Michigan (17-0, 6-0 B1G) on Sunday night. Northwestern (10-7, 1-5 B1G) got crushed by a much better team (arguably the best in the country) playing at the top of their game. Of course, below the surface there is a lot more to dissect. The Wildcats’ leading scorer, Vic Law, was announced out at game time due to a lower body injury. As an essential cog on this often-outmatched team, Northwestern was consequently doomed for failure. However, Pardon stepped up and delivered a solid offensive performance with 20 points on 10-16 shooting. The bad news is that he only pulled down two rebounds, his low on the year. Other bright spots for the ‘Cats were Ryan Taylor and Anthony Gaines. Taylor added 15 points and shot 4-7 from beyond the arc. 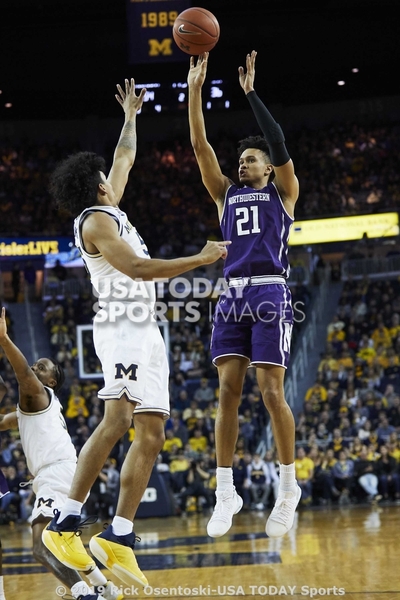 He is clearly Northwestern’s most prolific three-point shooter and will needed to continue to step up in Big Ten games to push Northwestern through the finish in closely contested matchups. Gaines spent more time in the paint tonight and it paid off as he racked up 10 rebounds. This is probably not the ideal role for Gaines, but it is a plus that he has the ability to rebound when necessary. This is Gaines’ second straight game as a leading performer, which should translate into more minutes and a larger role in the offense. Michigan jumped out to an early 10-0 lead within minutes to assert their dominance. To their credit, Northwestern – though clearly outmatched – refused to fold and mounted a comeback in what was a theme for the night. Miller Kopp (8 points, 4-5 FG) led the charge, scoring 6 of his 8 points to cut the deficit to 19-16 with 10:30 left in the first half. Towards the end of the half, the Wolverines made it clear that they were not interested in another close game with Northwestern. Jon Teske scored 11 points in less than two minutes, and Michigan carried a 50-28 lead into halftime. Northwestern never again threatened Michigan, but they did put up a bit of a fight. In a eight-plus span at the beginning of the half, the ‘Cats went on a 17-7 run behind 8 points from Pardon to cut the deficit to 59-45. The Wolverines cruised the rest of the way to wind up with a 80-60 win. Chris Collins and company get a few days of rest before continuing the gauntlet of Big Ten play on Friday at a better-than-usual Rutgers team (8-7, 1-4 B1G).